One of the keys to connecting with people is to be able to communicate using their native language. Research shows how it may even play a significant role in skill assessment. “Mexican-American students speaking their native language have higher grades than those in English-only environments in U.S. schools” (UPI NewsTrack, 2011, para. 1). That gives a few reasons to learn more languages as a means to communicate more effectively. With the Internet reducing the distance between countries and improving the accessibility to knowledge, it is increasingly harder to choose what to study. As English is the most spoken language in the world, it is difficult to argue against it. If it is not your mother tongue, it should be the next one to learn. After that, even being only the 11th most spoken language, an attractive option is to study German. 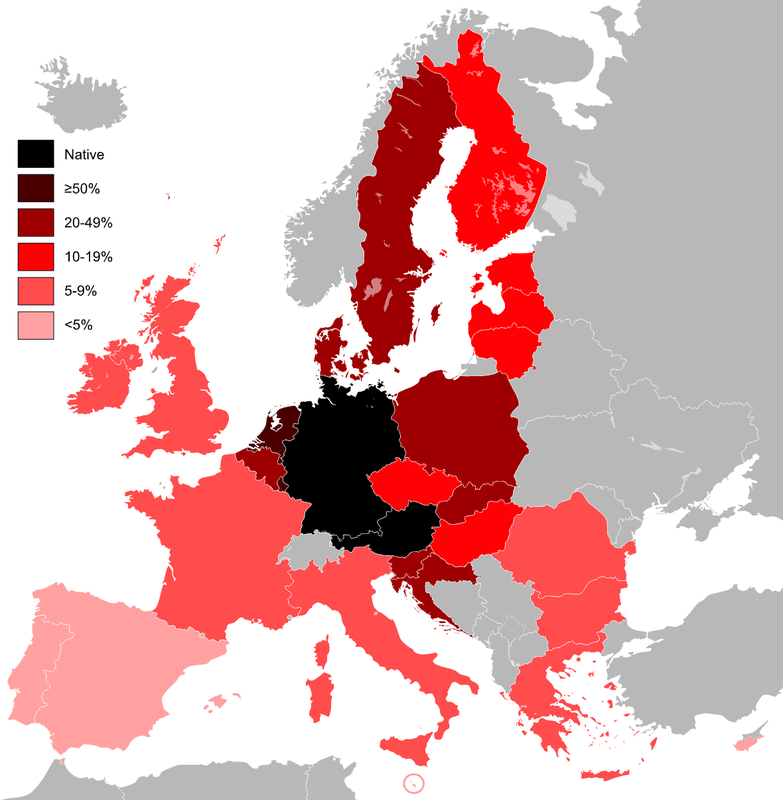 Knowledge of Standard German within the states of the European Union. Created by Alphathon. German is an excellent third language to be learned. Since it is an official language in Germany, Belgium, Austria, Switzerland, Luxembourg, and Liechtenstein, becoming fluent in German prepares one to communicate with 95 million native speakers. But the benefits are not limited to these six countries. The European Union (EU), a union of 28 different states, also have decided to adopt it as both official and working language. In practice, it means that the EU accepts German as a primary language in their internal communication, representing an invaluable instrument both for those who work in governments and companies relying on their regulations. However, before considering German, many people focus on learning English, since it is the most spoken language in the world. Such action is quite reasonable and, oddly, doing so may end up boosting your proficiency in German. English and German are both in the West Germanic category of languages having a lexical similarity estimated to 60% (Simons & Fennig, 2018). It is easy to notice the closeness once someone starts paying attention. Kindergarten, for instance, has the same meaning in both languages. The only difference is that German capitalizes all nouns, therefore using “Kindergarten” even when not starting a sentence. In other cases, with a little effort, it is possible to notice similarities between whole sentences such as “Ich habe keine Kinder” and the English sibling “I have no kids.” The ability to communicate in English makes you two steps ahead of doing the same in German. Finally, the most important reason German is an excellent third language to be learned is that one of the most powerful nations in the world speaks it. Germany was a protagonist of both world wars and was able to grow significantly since then, becoming the fourth largest economy on the globe. Also, it will hardly lose its position as one of the leading members of the European Union since the country has a central geographical location and is the member with the largest population. For all of these reasons, one may find many opportunities for doing business with and getting hired by German companies. The government has been quite open for professionals with knowledge, either practical or academic; “skilled workers from other European countries make an important contribution to the competitiveness of the German economy,” says Federal Minister of Labor Hubertus Heil (MIL OSI, 2018, para. 5). One of the examples of the ministry receptiveness for foreign labor is the availability of a “skilled worker” visa also for non-European citizens. This visa grants several benefits through a simple application process. Although other languages may have more native speakers, German is still an excellent opportunity for both education and business. Once someone already knows English, it gets much easier to understand West Germanic languages such as German. With some effort, people can increase their perspectives by communicating with one of the most powerful nations in the world.